Cairo’s museums are home to some of the richest collections of Islamic art in the world. Long the seat of great dynasties, whose rulers and descendants both amassed and patronized works of art, Cairo’s status as one of the wealthiest and most populous cities of the medieval world is reflected in the exiquisite arts and crafts that make up its collections, which expanded in the twentieth century through the purchase of private collections so that they now include not just the arts of the dynasties that made Cairo their capital, such as the Fatimids, Ayyubids, and Mamluks, but material from other important areas of the Islamic world, such as Iran and Turkey. Masterpieces of every medium are represented, including the decorative arts of ceramics, metalwork, textiles, woodwork, glass, carved stone and ivory, and the art of the book. The objects vary from pieces made for purely secular purposes, many of them with blazons showing that they were the property of the great amirs of the time, to some of the choicest examples recovered from the architectural masterpieces that permeate Cairo’s landscape. 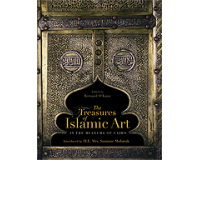 An introductory chapter guides the reader into the world of Islam and its art, while subsequent chapters unfold and describe the riches of the works of art that were crafted and amassed throughout the ages. The book is lavishly illustrated throughout with specially commissioned color photographs. Contributors: Mohamed Abbas, Noha Abou-Khatwa, Farouk Askar, Mohamed Hamza, Bernard O’Kane.